Nugget having been diagnosed with kidney problems in 2010, I had to learn quickly what treats he could and could not have any more. All treats with red food dye I removed immediately… but wanting SOMETHING to spoil him with, his doctor recommended sweet potatoes, or …as some of us know them as, yams. Visiting the local Pet Smart store, I found a very small bag of dried yams, marked healthy treats. The pieces inside were the size of short French fries, like those served in most restaurants throughout Ontario. Having paid nearly $10 for what seemed like only a small handful of these healthy treats, I decided to try making my own. Friends picked me up an inexpensive dehydrator in good condition, at a local yard sale, allowing me the pleasure of trying to create these treats as inexpensively as possible. If you would prefer purchasing one new, Canadian Tire has a really good dehydrator for sale, for only $50. NOTE: I do NOT recommend using microwave ovens under 1200 Watts for cooking these. I burned out a 1000 Watt oven in just over four years cooking approximately 7-8 lots of Yam Yummies for Nugget. The first time I tried making Yam Yummies, I only used one yam. That way, too, I could make certain that Nugget was happy with my ‘cooking’. Scrub yams so all dirt is removed. I like to place them on a paper towel to dry. 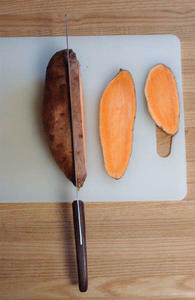 Place yam on cutting board. 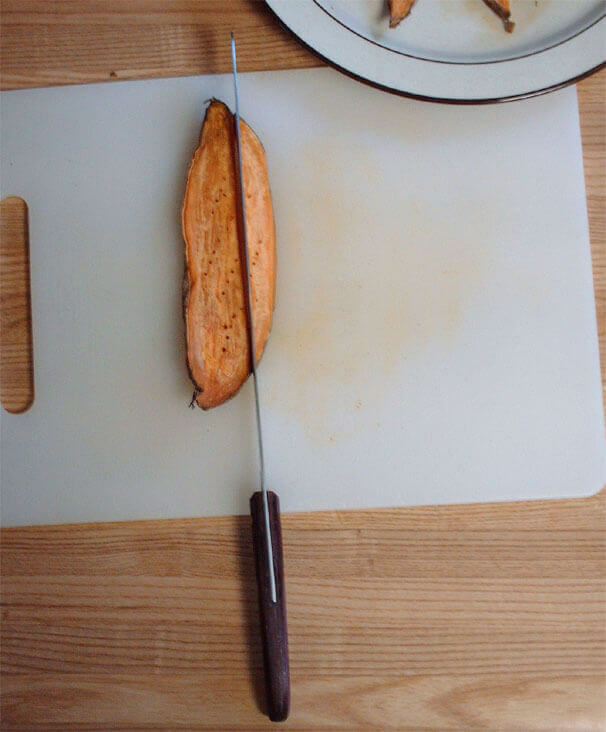 With a sharp knife, cut a small slice off one side of the yam to create a flat base for the yam to sit on so it is less apt to roll as you continue cutting into slices. 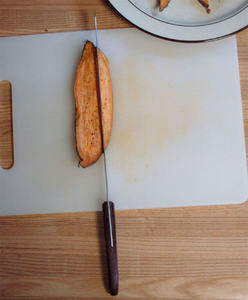 Place the yam on the flat side you just created, and start slicing… anywhere up to ½” in thickness. NOTE: The thicker the slices, the longer it takes to cook and dehydrate. TIP: Be real careful with the knife during this step. Yams are a whole lot harder to cut when raw. 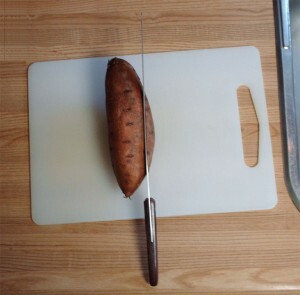 It will take force to slice the yams. As the knife gets closer to my hand with each slice, I will turn the yam and slice from the wider side again… because I’ll be cutting my slices into pieces once cooked anyway. 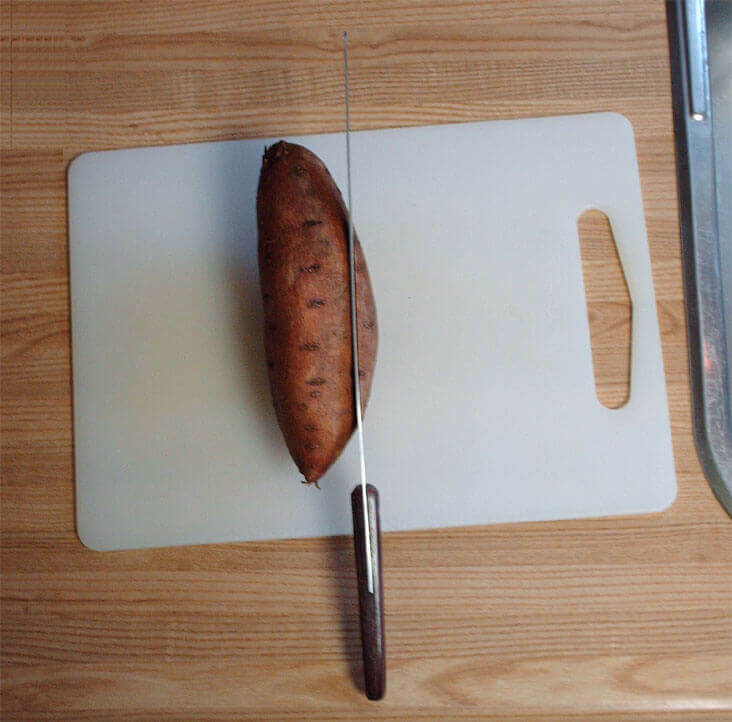 My wrists are not as healthy as I’d like to have them… but I can STILL slice up to 5 yams without painful wrists. Using a microwave-safe plate (I use to a dinner plate), arrange the slices in one flat layer. 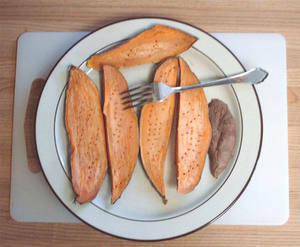 Set your microwave on full power and cook for 4 minutes on either side.NOTE: Use a fork to flip them as they will be HOT after the first 4 minutes.TIP: I use my wet paper towels from draining the yams, here as pot holders on my dinner plate when removing it from the microwave each and every time. Once fully cooked on both sides, pierce the slices with a fork so the water can be released that much quicker… ideally to shorten the time in the dehydrator. TIP: I actually pierced these slices even more after taking this photo. If you have a large dog, your slices can go onto the dehydrator tray now. However, I have a little Shih Tzu so; I need to cut my slices more, so the pieces will be smaller… PLUS the smaller the pieces the less time needed to dehydrate. NOTE: Your cutting board WILL become stained during making Yam Yummies, so if you want to keep your white plastic cutting board white, either use a cutting board specifically for making these healthy treats, or be prepared to treat the cutting board for stains afterward. My dishwasher is really good at removing these stains, yours might not. My good ole’ 1000 Watt RCA microwave used to like to overheat and shutdown at about the 3rd… sometimes 4th plate of yams. This used to force me to take a 10 minute break. Now I’m using a Panasonic 1200 Watt microwave so next batch should cook a whole lot faster! 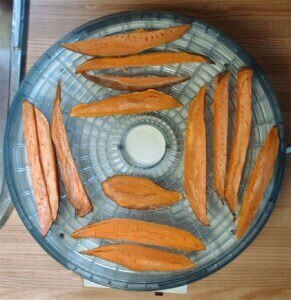 Arrange the yams on the dehydrator tray so that there is airspace between the pieces. Once you’ve filled all 5 trays (my dehydrator has only 5 trays), put the lid on and turn on the dehydrator.I have found my pieces are pretty much cooked after 8-10 hours, so I would highly recommend you start checking yours after 8 hours. NOTE: If you are cooking the larger slices, I would suggest anywhere from 10-20 hours. Again, this will depend on how thick the slices were cut. TIP: When done, the pieces will look leathery and some may even be curled up on the edges. Test each piece to see that it is fully dried out… because you will want to store these in a container in your cupboard… and, you don’t want them going moldy. Make sure to have your product taste tested… then store remaining pieces for future use. And… no, he’s not growling in the first photo; he’s chewing. Nugget couldn’t eat his Yam Yummy any faster if he tried. Nugget is the most spoiled, little dog you would ever want to meet… especially when it comes to treats. 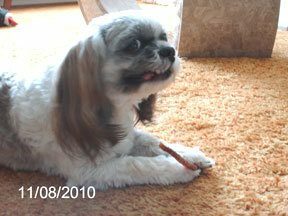 He used to love his dog cookies… you know, the ones by Pedigree Pal; their Breath Buster brand… THE best on the market today! Well, now every morning he refuses his cookie and sits pretty for a Yam Yummy. I have been making them for years! I have a Chesapeake Bay Retriever and she is on a grain free diet, no corn or wheat. My in-laws Golden is wheat intolerant as well. We regularly dog sit for our friends and family's wide range of dogs, everything from our Chessie to a Golden, a Boxer mix, Great Dane/Mastiff puppies and the most amazing Staffordshire Bull Terriers on the planet and they are gobble these right up! 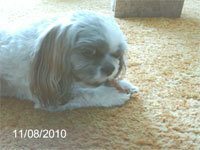 Thanks for commenting K. Crox, I'm glad your dogs all eat well, and being as you mentioned that two of the dogs are on special diets… I would like to share this post with you: https://trishparr.com/revolution-the-truth-why… my Nugget was put on a low-protein diet in late 2009, but since his surgery last year, he's now back on regular dog food. Just a "heads up" IF you or any of your family members are using any type of flea/tick protection. I bought a 9-tray dehydrator to make special treats for my doggie boutique in Rockport, Mass. Last night I dehydrated 5 sliced yams (and a finger) and wish I had looked up your tips before I started. I love the idea of microwaving to pre-cook. I boiled them sliced which 1) added more moisture….something we don't want and 2) some broke apart when slightly soft. I also love the tip to pierce to allow to dry better and last, to cut them smaller to speed drying, The small slabs and pieces did take 8-10 hrs. Smaller pieces dried faster, so kept checking and took out those first. I was surprised at how they held their color so well. The expensive ones you buy in a bag are rather brown. THANKS! Hey Pam, at least you'll know not to boil the yams first for next time. Heck, we've all made mistakes. 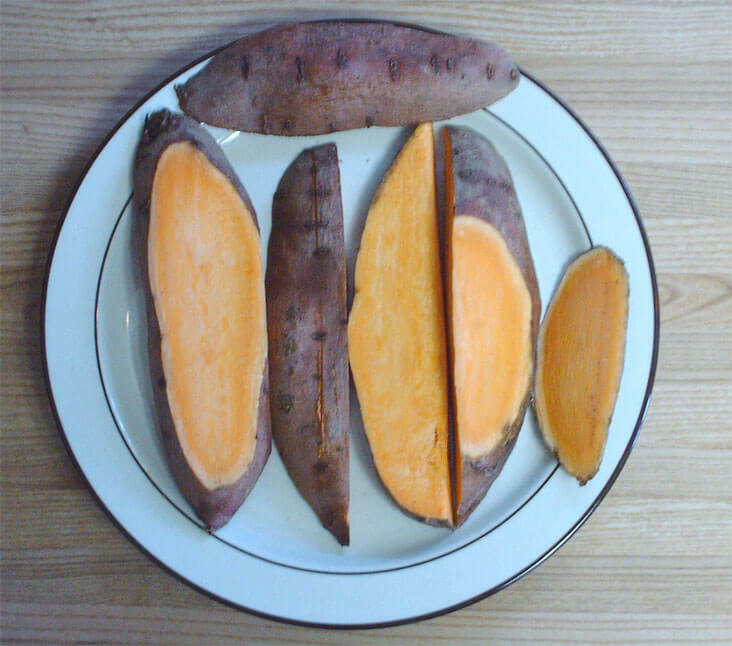 I find that the REAL fresh yams make the sweetest yam yummies and the colour is retained even better than the older yams. I found the yam treats you buy are very expensive… and, where are they made? Home made treats for my little guy is a pleasure to do! I'm dog sitting our friends' dog – we have 3 Chesapeake Bay Retrievers and he was one more. They brought a bag of these from the pet store. There were only 5 slices for $6.99 and they were even more expensive on Amazon. So for 4 dogs it's done pretty much for the one package. Thanks for your instruction as I plan to make some more right away and then send some home (hopefully!) with the owners of the other dog. what a great recipe! it’s really innovative and well illustrated. thanks a lot! Glad you found it Maxine. Hope your dog loves them as much as my Nugget does! I can recommended this website for all ages, as it contains good and informative stuff! excellent recipe! i really appreciate your sharing this. this recipe is really awesome, and thank you very much for sharing it! This recipe has inspired me to write a few of my favorites on my own blog! Hey, now THAT sounds like a GREAT idea. Be sure to come back and post a link to your blog recipe, won't you Lacy? usually i do not comment on blogs, but i would like to say that this recipe really convinced me to say thanks. Very nice post! Wow! Your comment is much appreciated Carlos! Reckon my dog will eat these. Your dog will love them James! Impressive! Health treats for my dog… thanks! Excellent recipe, thanks for share it with us! wonderful recipe, i like it, thank you very much! nicely explained. truly impressive and nice recipe instructions. thanks for sharing! Thanks for the compliment BIanca! Glad you found it helpful. this one sounds good and hope my dogs love these! I'm sure they will Alessandra. I hope my dog likes these treats! I bet your dog will love these. Mine does! your website is like an encyclopaedia for me, thanks for posting this recipe! i believe i just stuck gold with this doggy treat recipe. thanx! i was very pleased to find this. i wanted to thank you for this great recipe!! it’s my first time visiting here and i found so many entertaining articles in your blog, especially your rants 🙂 . Well Camille, I do hope you'll be a regular reader of my blog. Thanks for leaving your comment! i just wanted to make a quick comment to say i’m glad i found your blog. thanks for this! I want your dog so badly I am tempted to sneak in and do something felonious (just kidding!). What IS he? Where can I GET one? I want one JUST LIKE THAT ONE. 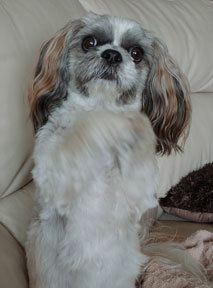 Nugget is a Shih Tzu with a really nice cut. Most groomers make Shih Tzus look like a silly lion with a mane around their heads, but my groomer makes each dog look great as she works with their features. My Nugget is a rescue too! Health treats are always a welcomed treat for my dogs. Thanks! thanks a lot for sharing this idea! like this information a lot, thank you! thanks for the great post. it reminds me that i have to bring more structure into my blogging. Your blog is very interesting. Please let me know how to go for your rss feed? Thanks Cecilia! To subscribe to the RSS feed, go to the very top, right-hand corner and click on either "Posts" or "Comments" and then follow the Subscribe Now instructions on that page. Hope that helps. These look like a GREAT idea for a special treat for my special friend. Thanks Trish! Hey! I just came upon this site today while looking up for some fitness terms in yahoo. Stuck around a little to check things out and read a few of your articles. Every enjoyable stuff. I’m going to be sure to come back and catch up on your new posts. This one is being forwarded to a dog-loving friend of mine. Thanks! Hey, thanks for this recipe. My dog will just love these! That is a fantastic idea, thanks for sharing! Heeey, I’m going to try these for my dog for sure. Thanks! this one is very interesting I shall have to give it a try. Hope my shepherd cross will love them. Let me know if your dog like them, won't you Carol? impressed with your recipe. Quite unusual and healthy. thanks! Great recipe idea. My dog will love these! Thanks!!!! Wow, these look so easy to do too! They are easy to make Rick! A really quality treat for my best friend… Laddy! incredibly good recipe for my dog! Hope your dog loves these yam yums as much as my dog does! It is said, the devil is in the details… and that could not be any more correct here. Great recipe…THANKS! Wow, and thank YOU Zharfan! 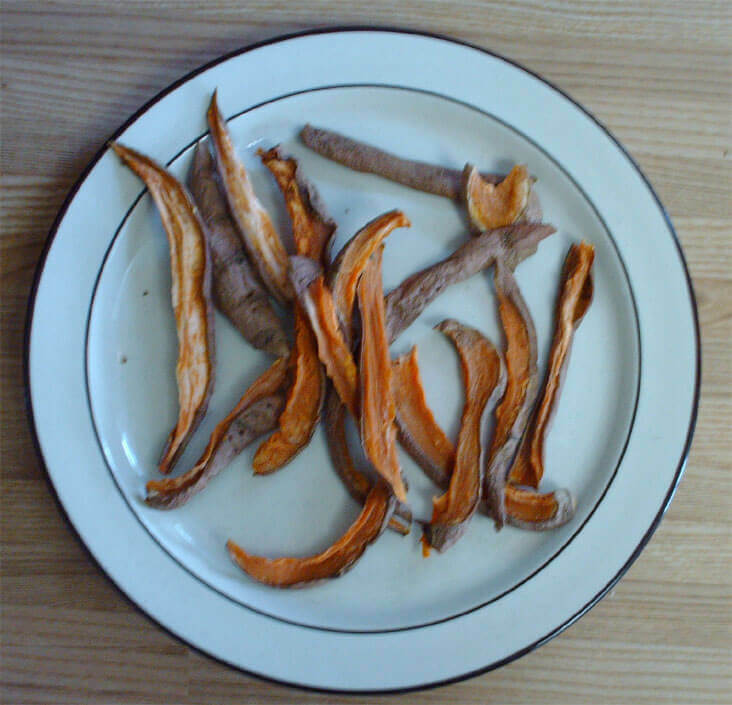 I have been sitting at the computer looking for about 3 hours for something on Yams or Sweet Potatoes dehydrated for dogs and came across your sight. This is going to be very helpful on starting to do this for my dog that was recently diagnosed with Pancratitis and needs a low fat diet. There is little to very few dog treats that are low in fat "and healthy for a dog". I had been giving her Chicken Treats (made in China) and NEVER AGAIN. Never a dog treat that says "Made in China". Thank you very much. I know EXACTLY what you mean Charlene. I refused to by anything eatable that's made in China, be it for human or pet. Am so sorry to hear that your little jem has been diagnosed with Pancratitis. Hopefully your "puppy" will enjoy these homemade treats. Wow, these sound easy to make and healthy too, obviously. Thanks! Great idea for health treats… thanks! These treats sound awesome… and a whole lot cheaper to make too. Thanks! They are Tom, and your dog will LOVE them! You have a great weblog and I like your style of writing about different stuff. Keep up the good work! hi i found your site today and I have read some great posts here. I just wanna say thanks to you for sharing so we all can learn! You're welcome Andrew. Thank YOU for your compliment! Thanks so much for this recipe!. what setting do u put the dehydrator on & was I supposed to cook them 4 minutes or 8 minutes in the microwave…was a little confused about that….Great Idea though Thanks! Sorry for the confusion Lisa, my dehydrator only has one setting. If yours has more, I would suggest you use the highest setting. I put the plate of sliced yams in for 4 minutes, after which I take them out, turn them over and return them for another 4 minutes. Most times they're done after 8 minutes… sometimes some slices need a few minutes longer to cook. Your dog will LOVE these treats. Mine does! What a great idea to make vegan treats! Awesome Nicole! I'm glad I could help out. 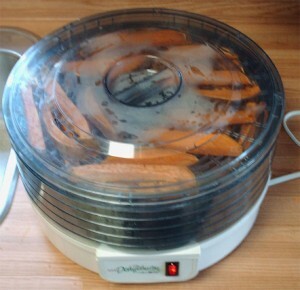 You might also want to check out yard sales for a dehydrator… or your local "used" stores. Bets you'll find a really great used dehydrator at ONE of these sources …and save even MORE money! The cheapest sweet potatoes I was able to find this past year, were those sold at the local farmer's market. 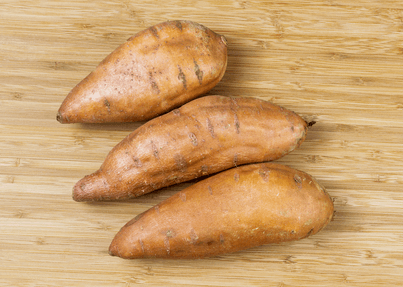 The sweet potatoes sold in my local grocery stores are a lot smaller… and these are sold by the POUND! The farmer's market sold them for 4 humongous potatoes for $5! What a niiiiiice savings. Just make sure to use the sweet potatoes a.s.a.p. Don't wait until one goes bad. BOY! Do they stink when they rot. I loved this little tutorial, it is really informative! I was at petsmart the other day and during my checkout the ringing associated asked me if my dog would like to try one of their new treats. 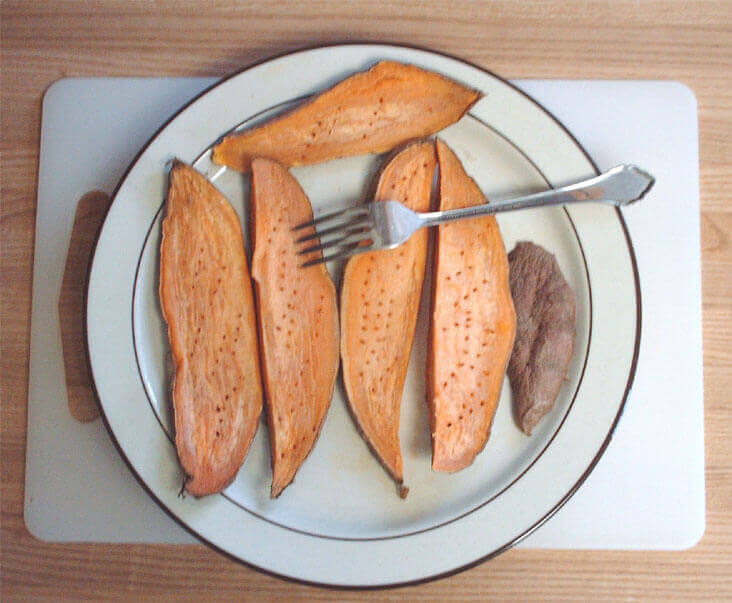 It was an all natural dehydrated sweet potato piece about an inch long wrapped in a thin slice of duck. My dog absolutely loved it, and it also took her a few minutes of gnawing on it for her to finish it. I intend to purchase a dehydrator and start experimenting with all natural treats very soon!! Ooooooo, this looks so good. My daughter got a recipe from one of her roommates last year that had apples and yams in it. I made it and was disappointed. THIS recipe looks pretty much perfect. Our dog will LOVE these!